Sources claim Ben Affleck's nanny tipped off the paparazzi to their affair. 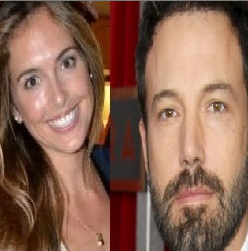 Rumors about Ben Affleck's alleged affair with his and Jennifer Garner's nanny, Christine Ouzounian, continue to swirl despite Affleck's rep denying the Us Weekly story. But now a friend close to Ouzounian, as well as other sources, tell E! News more details about the caretaker's relationship with both Affleck and Garner. "She was not doing her job of being a nanny," one source close to the couple explains. But photographs of Ouzounian and Affleck, taken July 17, seemed to show them hanging out together even though she was no longer working for them. But another source tells E! News that Ouzounian actually tipped off the paparazzi to have them take photographs of her with her former employer. Affleck supposedly became "very upset" upon discovering the photographers. As E! News previously reported, the reports of an alleged affair are categorically "not true," according to a rep for Affleck. "It's tabloid journalism hiding behind blind sources," the rep added. "It's a shameful ploy to stay relevant for the magazine." Meanwhile, a close confidant of Ouzounian tells a different story. The friend tells E! News that according to Ouzounian, their great employment arrangement—she had previous experience with high-profile families—ultimately transitioned into something inappropriate. "What started out as a flirtation quickly turned into more," the pal says. But Garner didn't let her go for a while because she was a "sweet girl" and her children "adored" her. When Affleck and Ouzounian began to hang out more, she told her friend that he would set "covert meet-ups" and their professional relationship turned romantic. "...Eventually she couldn't contain her excitement and spilled the beans that she was dating Ben Affleck...she told her friends she was completely in love with him," Ouzounian's friend explains. "Ben told Christine things that led her to believe they were going to be fully together. Over the course of the last few months, their relationship became very real and serious to Christine." Although Garner was "very, very suspicious" of her nanny, the friend adds that Ouzounian told her she wasn't fired until Garner "found out that Ben and Christine had been intimate" while in the Bahamas. According to Ouzounian's friend, that was Garner's breaking point. E! News has reached out to Ouzounian and Affleck for comment. And she is proud of this Sh!t ?